Josie is Craig's dog. He thought I was having too much fun with my two, and wanted to join in. As this is written, she is just a few weeks short of one year old. Craig has taken a little bit different approach to training Josie than I took with either Mace or Ember. He has started with quite a bit of obedience work, along the line of what Tim Taylor teaches in his "Started Stock Dog" videos. She learned a good "down", and to "give" to a stock stick that blocked her way. Once she was consistent, she was ready to start her stock work. 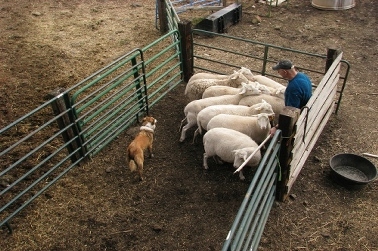 She stayed on a long line until those obedience commands were consistent around the stock too. Craig also introduced her to flanks and "walk-up" while she was on a long line. At three years old, Josie is a good helper on the farm. She will fetch a single cow or the entire flock of sheep. She knows inside flanks, so that Craig can stand by the gate and direct her to put the stock wherever he wants them. She is always eager to work, and is a happy girl when she has a job to do. 499 Milt Springs Loop, Grangeville, ID 83530. Here, Craig is sending Josie "away" to move the sheep out of the corner. She would prefer to go straight toward them, but Craig is guiding her with a long line, and she's learning to take her eye off them and get around. Next Craig added pen work. We feed the sheep their grain in an 8' by 16' pen. 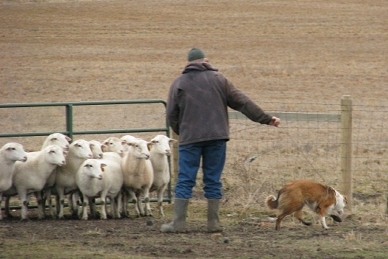 Pen work can be really hard for a dog, because working so close to the sheep puts a lot of pressure on the sheep and the dog. Josie quickly learned to start the sheep moving, then lie down to take the pressure off of them. Here is Josie practicing her pen work. You can see how close she needs to be to the sheep. You can also see how Craig is blocking one direction with the stock stick/pipe to tell her to go the other way. Pushing through the narrow spaces behind the sheep to get around them was scary at first, and Craig worked with her on a long line to show her what she should do. She quickly gained confidence, and graduated to working without the line. I've been so impressed with the calm, confident manner she has developed as she follows Craig's direction. No pictures, but Josie also rides with Craig in the tractor to feed the cattle. She has learned that she can push them away from the feeder while he takes the twine off the round bales.